Today’s post comes from Alexandra Caspero MA, RD, CLT of Delicious Knowledge. Alex writes about plant-based recipes and nutrition topics and offers nutrition consultations! In the past five years of seeing clients for weight loss, I can count on two hands the number of times I’ve given out calorie counts and meal plans. It’s not that my clients don’t want this information; rather, I don’t find it the most effective path for helping them achieve their ultimate goal: weight loss and satisfaction from foods. It’s one thing to cut calories, it’s another to feel satisfied and nourished from foods. I find that when my clients restrict their caloric intake by reducing portion size or skipping snacks, they do ok for a while… until they don’t. Until they overeat at lunch one day and find that they can’t stop. Or they give up, because counting calories is too tedious and clients would rather feel liberated with food, not burdened. I understand all of these normal feelings associated with dieting and the best part is, there’s an easier way. Enter the principle of nutrient dense eating. Or, as I like to call it, “the biggest bang for your calorie buck”. Nutrient density examines the quantity of nutrients you receive from a food given the number of calories it contains. It’s a simple way to balance nutrients with calories. Simply stated, we should emphasize foods in our diet that are rich in vitamins, minerals, phytochemicals and antioxidants- and low in calories. Examples include fresh fruit, vegetables, and whole grains. The best part is that almost all foods can fit into this plan. Craving a bowl of fettuccini? Me too! Add in some nutrient dense vegetables and a side salad. You still get to enjoy the flavor, texture, and comfort of pasta while filling up on fiber & water-rich vegetables. Nutrient density works as a weight loss/weight management tool because it doesn’t feel as restrictive. You still get to enjoy your favorite foods by dressing them up with nutrient dense ingredients. A great example of this is stir-fry. I don’t know about you, but I love stir-fry, and we eat it a few times a week. Traditional ingredients include: rice, vegetables and a protein. If I was going to serve a normal size portion of 5 oz. protein, 1 cup rice, and 1 cup vegetables and sauce, that would be around 400 calories. A nutrient dense portion would be 4 oz. 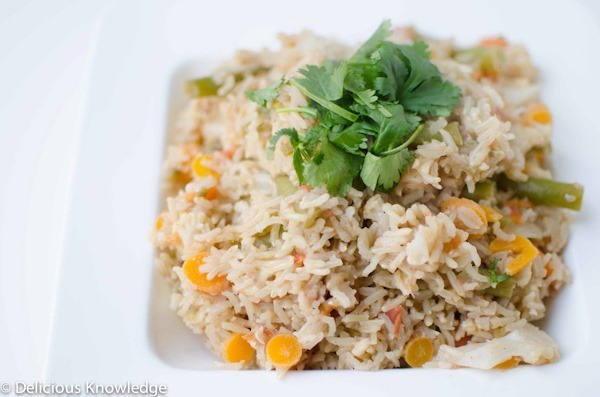 protein, ½ cup of rice and 2 cups of vegetables with sauce. It’s the same amount of food with fewer calories. You are still enjoying the same type and volume of favorite foods, just switching up the ratio. Why does nutrient density work for weight loss? Volume and fullness are important factors in satiety. As we start to digest food, our stomach gradually expands, sending a fullness message to the brain and therefore reducing the desire to eat. This signal is more pronounced when we are eating filling foods, those that contain fiber and those that contain protein and fat. Of all the macronutrients, protein is the most satiating. This is why you will still feel full after eating the nutrient-dense stir-fry. The amount of calories you consume doesn’t factor into the feeling of fullness; rather, the type and volume of foods are more important. Nutrient dense eating cancels out the deprivation factor of traditional weight loss diets. Calories count, but if we cut out too much we are left tired, hungry, irritable, and much more likely to overeat at the next meal. Feeling satisfied is so important to having a healthy relationship with food. By choosing nutrient dense foods, you can fill up without adding extra calories. You get the benefits of a traditional diet plan, without feeling like you are actually on a diet. 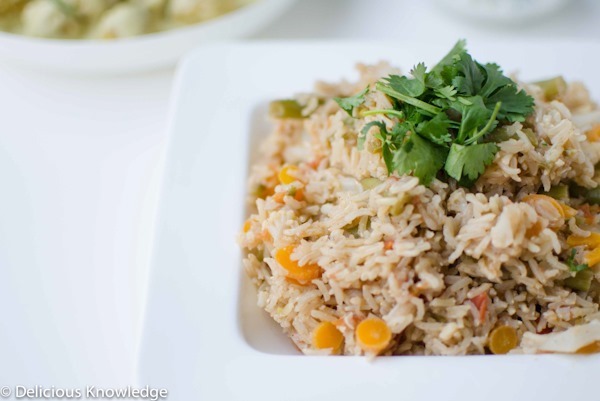 I’ve included a recipe for one of my favorite nutrient dense meals, Indian vegetable pilaf. I don’t know what it is about carbs, but I generally can’t get enough of them! (I’m going to go out on a limb and say it’s my Italian heritage : ) ) By adding green beans, cauliflower, carrots & tomatoes to this flavorful pilaf, I am still able to enjoy a large side of rice- by increasing the nutrient density of the dish! Now, I can almost enjoy double the amount of rice I normally would for the same amount of calories. That’s a win-win in my book. Satisfied, flavorful and I don’t feel like I am depriving myself of what I really want. Add a piece of protein for a more complete meal. In a large frying pan, melt the butter over medium heat. Add the onion, garlic, ginger and cook, stirring often until lightly browned. Add the chili pepper, cumin, turmeric, garam masala, tomatoes and cook for another 5 minutes, until the tomatoes have softened. Add the vegetables, rice, water, a pinch of salt and bring to a boil. Cover and cook for 15-20 minutes until the rice is soft. Fork rice once done and serve with cilantro garnish. 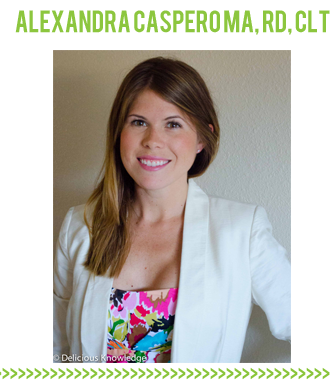 Alexandra Caspero MA, RD, CLT is a Registered Dietitian and personal trainer who specializes in plant-based diets, sports nutrition, food intolerance and weight management. Her blog, Delicious Knowledge, focuses on making healthy food easy- with delicious, nutritious recipes that highlight seasonal, vegetable filled meals. Follow her on Twitter @delishknowledge and Facebook @DeliciousKnowledge. I love this approach! I see this very much in how you eat, Kath. I’ve lost 27 pounds with this approach and have more energy and feel more full and satisfied than I did eating way more calories. Cant recommend this way of thinking enough. Truly a sustainable lifestyle. Oh my gosh yes! Yes times a million. I’ve done the weight watcher, I’ve done just counting calories, I’ve done cutting out foods and none of it works for a long time. I start to track and then I have the moment where I just cannot stand it anymore and I throw myself off the cliff. I found that if I start eating clean and with more plants I at least stop the gain and slowly turn myself into a loss. I love that you focus on this! Such a great post and it filled me with a ton of hope that perhaps I’m doing it right finally. I cannot wait to make this dish either it, sounds awesome! This is a great tip – focusing on getting in more vegetables rather than taking away other things. I have a problem with calorie counting and just can’t get it out of my head. It’s hard to forget or not think about! Thanks for sharing your expertise with us, Alexandra! I love these features and this information in particular. I find it hard to balance my plate when there are carbs involved- I still feel like I need to have a hefty pile, so I am slowly trying to replace that with more veggies. Good reminder too that protein is important to feel satiated! It is easy to try to restrict calories and eat processed foods that are low-fat, fat-free, etc… but they don’t leave you satisfied, wanting more. Anytime I am wanting to drop a few, I always find myself pulled in this direction. I think it is a great reminder that food is fuel. Give it the nutrients it wants and your body will tell you when to eat and when you are full. I love these posts! This is my lifestyle/diet (I hate the word diet) exactly. Thank you for putting it all into words for me this morning! I intend to share this link with my readers tomorrow. How do you make garam masala if you can’t find it where you live? I love thie guest RD series you have going! I love that you’re introducing us to knew blogs, I am always looking for another great blog to read. Thanks! More vegetables is always good advice. Thank you very much for the interesting guest post! I love this concept and have been trying to practice it more regularly. My favorite nutrient dense food is massaged kale. I can’t get enough. that recipe sounds delicious and satisfying. i am very desperately trying to get my parents on this lifestyle. they tend to overeat or restrict on one of their “diets.” it drives me bonkers! I totally agree with this — these were the same principles that I learned in Weight Watchers to lose weight after college and that I still use to guide my eating today (without counting anything!). I honestly believe that you can eat nearly anything you want as long as you include a big serving of vegetables. I have also had trouble reading the comments. Great post and the recipe looks delicious! I love this idea. And that pilaf sounds great! I love this idea & that recipe looks delicious! Awesome post, Alex 🙂 And you have a great name 😉 I really love these posts, Kath! Eating nutrient dense foods has been a big part of my recovery from an eating disorder, in part because my body just feels really good when I eat this way. I eat a really well-balanced “diet” (by diet I mean food in general), that’s mostly vegan and mostly un-processed. It works for me because I get to experiment with different foods in the kitchen and make yummy miso ginger lentils but when I want to enjoy a pizza or a veggie burger and fries, I do it. I make room in my life/diet for those things too! Love this philosophy!! I especially like the focus on adding vegetables to make meals healthier. Mentally, I think it’s easier and more comforting to focus on what you can do or can eat as opposed to what you can’t when trying to eat healthy or lose weight. Not only is eating nurient dense foods good for satisfaction and weightloss it ALSO is the best for your overall health. The foods that are most nutrient dense are, and always will be, REAL and natural foods, as processed foods are stripped of many of these oh-so-valuable nutrients our bodies are craving. Emphasizing on including foods that are very rich in vitamins, minerals, phytochemicals and antioxidants will be best for EVERYBODY interested in lesser sick days, more energy and more overall vitality! Yeah. I guess it’s never easy to strike a balance and hit just the right diet that comes with the right calorie count and a real great tasting flavor you’ll simply savor. But hey …. what can I say … there’s gotta be a trade off somewhere.